Note: This article reveals some plot details from the movie Wonder Woman. There’s no shortage of reasons why Wonder Woman has become one of the buzziest and most financially successful of recent superhero origin stories. The DC comics adaptation is the first solo big-budget treatment of a female superhero in many years, the first big superhero movie directed by a woman, and the first big-screen adventure of a beloved, iconic character with plenty of name recognition from non-fans. These elements inform the movie’s creative success, but something less expected also helps Wonder Woman stand out among the annual pack of comic book adaptations crowding the multiplex: It’s a genuinely moving superhero romance. Introducing romance into a contemporary superhero narrative, particularly a female-centric one, is tricky business. There are years’ worth of comic book stories where romantic plots are treated as either prelude for the placing of damsels into distress or dithering comic side business often predicated on deception. There’s an understandable desire to make female characters from comic books more than arm candy or refrigerated motivators, which may be why so few movies from the modern superhero boom go all-in on a romantic subplot. Instead, superhero love on the big screen tends to be vaguely unrequited (Wolverine and Jean Grey), vaguely businesslike (Cyclops and Jean Grey), outright unconsummated (Captain America and Agent Carter), or largely offscreen (Pepper Potts and Tony Stark, who banter beautifully but aren’t actually dating during much of the Iron Man trilogy). On paper, the romance in Wonder Woman hews pretty closely to other movies of its type, especially the one it most resembles, Marvel’s Captain America: The First Avenger. 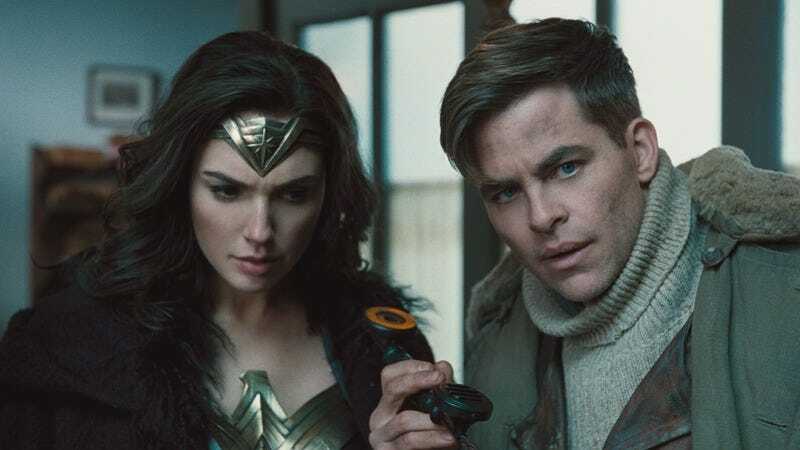 Gal Gadot’s Wonder Woman (known undercover as Diana Prince) and Chris Pine’s Steve Trevor meet early in the film under extraordinary circumstances that demand more of their attention than their growing attraction to each other, and by the end of the movie, they are permanently separated. They do not spend their lives together, grappling with the gulf between his humanity and her superhumanity. But the movie does go beyond flirty looks and a last-minute clinch. Although their initial meeting is followed swiftly by an elaborate battle sequence, there are several quiet scenes between Diana and Steve that luxuriate in rom-com awkwardness. Their scene together on a boat, sailing for London, is first-date material crossed with teenage bumbling: There are questions about their backgrounds and sweet awkwardness about sleeping arrangements, all with a sexual undercurrent that never feels creepy. Their burgeoning relationship has the first blush of a new romantic interest: Steve is literally the first man Diana has ever seen (and she implies that this has in no way left her sexually inexperienced). Yet because both characters are self-confident (and never less than respectful of each other), Diana’s interest in Steve is a lovely view into her humanity, instead of gimmicky or condescending. As they continue on their mission together, their closeness, both professional and personal, becomes touching. Some of this comes down to the actors: Gal Gadot and Chris Pine have an easy, charming chemistry, giving a pair of wonderful movie-star performances. Gadot is particularly adept at selling Diana’s wide-eyed wonder alongside her determination. But director Patty Jenkins also emphasizes their romance visually. While their team regroups later in the movie, Diana and Steve share an outdoor slow dance under a light snowfall, and Jenkins’ eventual overhead wide shot is swoon-worthy, making the characters seem, however briefly, modest and human-scale. The wider vantage turns out to be a good way to place such a towering superhero in an intimate context. The time Wonder Woman makes for this sort of moment could strike some fans as a step backward, or at least unequal treatment of the most famous female superhero. Many progressive viewers have been trained to cheer when a movie avoids love interests all together, and it is indeed a blessed relief to watch a contemporary Disney cartoon and not be absolutely sure that it will involve marrying off its heroine. By giving screen time to romance, Wonder Woman does pay more attention to Steve Trevor than most superhero movies pay to his distaff equivalents, and it feels less embarrassed to give Diana a mushy lesson about the power of love than movies about male heroes might. Those differences might seem sexist, but they’re also part of why the movie isn’t just a simple act of gender-flipping a formula. It helps that Wonder Woman doesn’t rely on romance alone for its emotional power; ask anyone who teared up during the scene where Diana first heads out of the trenches into battle, alone, in full superhero-regalia glory. But Diana and Steve’s final exchange in the film, played once with sound obscured and again with it cleared up to great effect, is another emotional highlight, and there’s no shame in that. Amid some fairly typical climactic bombast, it helps the movie reach a level of poignancy that other superhero movies seem to want but sometimes over-lather into an insular form of soap opera. Specifically, this romantic farewell captures something that the interconnected DC Universe films have previously yearned to convey without understanding how to: the gulf separating humans’ greatest potential and their darkest failings, and whether the former can be protected from the latter. Steve is enough a force for good that he will sacrifice himself for a world that (as Ares gloats) chooses these conflicts themselves, leaving Diana with love both for her (expressed verbally) and his imperfect world (expressed through his actions). The other DCU movies pontificate about the possible futility in acts of enormous heroism. But the earnest sweetness of Diana and Steve buoys this regular DC conflict, keeping it from weighing Wonder Woman down into grimness. And the relationship sets the movie apart emotionally, even when plenty of familiar narrative choices are made. Romance is often gendered as a genre or a subplot “for women,” just as action-packed superhero movie are often gendered as “for men.” This has left plenty of superhero movies, even good ones, doubly fearful of sexism: both afraid of it and afraid because of it. Filmmakers may be wary of turning a female character into a cardboard love object/damsel, but plenty are probably just as wary of comparisons to, say, Twilight, easily the most prominent of fantastical onscreen romances (and more virulently dismissed by a certain crowd than less moony-eyed genre fare). This caution ignores the rich history of romantic movies, both melodramas and comedies, and as outliers like Logan and Christopher Nolan’s Batman movies have shown, there’s a lot of value in letting superhero movies dabble in other genres, rather than letting them wander around a superhero echo chamber. Although Wonder Woman wouldn’t look quite so special if more superhero movies paid more attention to romance, the sheer number that downplays them manages to set Jenkins’ movie apart even as it adheres to certain aspects of the DC house style and the superhero genre overall. Moreover, love stories aren’t just a part of classic movie genres and Twilight; they’re also a part of life. DC’s extended universe has tried to imagine what it would be like if titanic, mythical figures interacted with the grit of the “real” world, while Marvel’s has tried (more successfully) to create a parallel world of fantastical derring-do and quasi-scientific miracles and then imbue it with messy humanity. The romance of Wonder Woman, no matter how swoony or relatively abbreviated, is what makes it feel particularly alive.